We love the magic of Christmas and can help you share the spirit – as quickly as today. Whether you’re looking for Easy or Unique, we have an option for you. 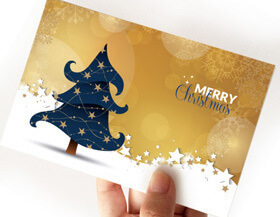 Select from a range of charity and pre-designed cards, which you can use as they are, or customise colours / alter the design to suit your business. With our NEW Foiling Solution you can add some bling, or subtly incorporate your logo as a shiny watermark in the same colour as the background. If you are short on time or have a large database, let us enter personalised messages on your cards, print the envelopes and get them in the post for you! Please feel free to call and speak with us about any or all of the options available. Customizable inside only with your logo, colours and text. If you would like a custom design, we would be glad to help – we’ve helped create some great cards this year already and would love to create the perfect card for you too. Show your customers or members you care. The time to get organised is now. 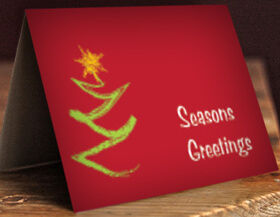 Get your Festive Greeting Cards organised fast. 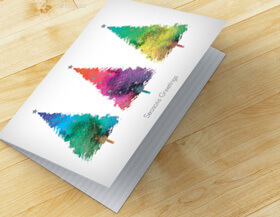 Ensure your Christmas Cards are printed quickly and accurately in high resolution on quality stock and dispatched on time with Same Day Printing. Simply let us know your requirements in the Christmas Card quote form on each page, and we’ll be back to you within 2 business hours – usually sooner. With a broad range of options available, we are prepared to create exactly what you have in mind. – If you have questions, call us to discuss your requirements – phone 1300 663 242. *Pricing correct as of 30/4/16. Pricing subject to change without notice.